Taylormade Acoustic Duo was started in 2008, and to date we have performed Acoustic Wedding Music at literally hundred's of Weddings all over the UK. Some Weddings are small intimate affairs with only 30 people, at other's we have filled dance floor's with over 200 people! We have performed Acoustic Wedding Music at all types of Weddings, from Church Wedding Ceremonies to Civil Wedding Ceremonies and Civil Partnerships. During this time we have met so many different couples, each of them with unique tastes and ideas but all with a passion for making their Wedding Day perfect! We've also dealt with power cuts, (we saved their Wedding Day by performing their Wedding Music with no amplification at all! ), leaking marquees and even been filmed by BBC television for a documentary on Modern Day Weddings! Also, we were recently married ourselves! 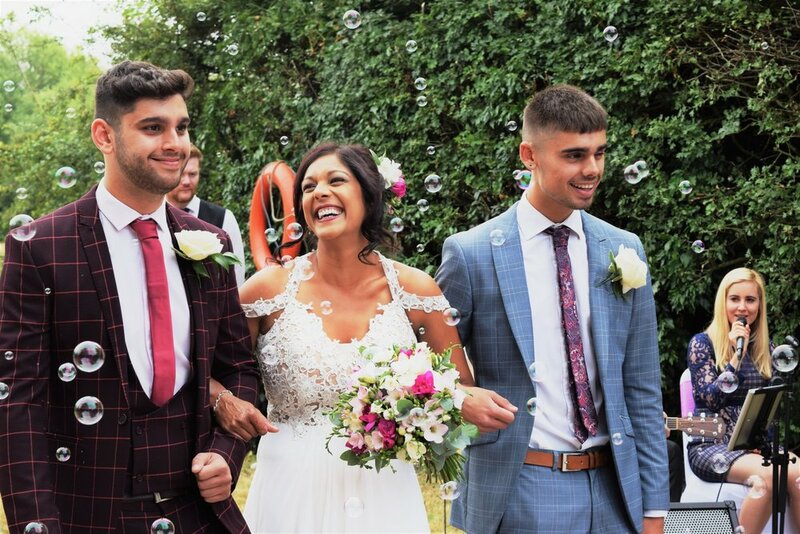 Not only do we have experience in performing at Weddings, we have also recently been on the same side as you..... as a nervous Bride and Groom with all the stress and excitement planning a Wedding can bring! It's this experience that is invaluable because it means we have experienced every type of Wedding and therefore we know exactly what works and most importantly.... what doesn't! Most people have never planned a Wedding before and therefore do not know what to expect or plan for their Acoustic Wedding Music... that's where Taylormade Acoustic Duo can help. We have put this page together from our experience at performing as both the Acoustic Duo and Live Band, to help you plan the Live Music you want for your Wedding Day. This is obviously the most important part of the day so choosing your Acoustic Wedding Music for your Ceremony can be very hard. 2 songs as your guests arrive in the Ceremony room and take their seats. This sets a beautiful tone for the day. 1 special song for the entrance of the Bride to walk down the aisle to her husband to be! 2 songs during the signing of the Wedding register. This usually takes around 10 minutes with photo opportunities etc. 1 final song as you exit the Ceremony room as Husband and Wife! The above is just a guide, at some Wedding Ceremonies we perform just 1 song, at others we have performed 8 songs. It's your Wedding Day and completely up to you.... please just let us know what you have in mind. In our experience, when you choose the songs for your Wedding Ceremony, it's a good idea to choose Acoustic Wedding Music which complement each aspect of the Ceremony. For example, as your guests are arriving you may want mid tempo 'feel good' songs like 'I'm Yours' by Jason Mraz or 'Let's Stay Together' By Al Green as they get your guests feet tapping and create a celebratory feel to the start of the Day. Next we would recommend having the big impact songs like 'Songbird', 'At Last' By Etta James or 'How Long Will I Love You' By Ellie Goulding for the Entrance of the Bride, as the Bride will want to do exactly that... make an entrance! Popular choices have been Ed Sheeran's 'Thinking Out Loud' and 'A Moment Like This'. Above: A picture from our vey own Wedding Day in Cuba....In case you were wondering, the Wedding Musicians we had were a Cuban Guitar Trio! For the signing of the register we recommend choosing a couple of songs everybody loves, to have you and your guests smiling away for the photographer. Popular choices have been 'It Must Be Love' By Madness, 'Kiss The Girl' from The Little Mermaid (for obvious reasons!) and 'I Believe In A Thing Called Love' By The Darkness. You can hear demos of some of these tracks on the player above. When you are finally Husband and Wife, about to make your way back down the aisle, we would recommend an upbeat song like 'Rather Be' by Clean Bandit or 'All You Need Is Love' by The Beatles to send you on your way to your new lives together and to signal the start of the less formal part of the day where you can sip Champagne and have your Wedding day memories captured by the photographer! If you have always wanted to walk down the aisle to a certain track, and it is not on our Acoustic Duo Set List, then please tell us. It would be our pleasure to learn that song for you free of charge, so that you can have the wedding you've always dreamed of.